Originally published for St. Louis Magazine Health & Wellness: Feb. 26, 2015. Click here to read online. Buddhist Philosophy was the most challenging academic course of my college career, hands down. After the first lecture, a handful of students vanished without a trace. Like me, they’d signed up thinking it would be an easy A and a fun, mindless way to knock off that dreaded philosophy requirement. I soon discovered that Buddhism is a whole lot more than interesting statues, fragrant incense and decorative prayer flags. There are two main schools—Theravada and Mahayana—and after that, the branches and terminology get a whole lot more confusing. I spent long nights memorizing flashcards and writing 20-page research papers. And I left the class confident, sure I was one of the most spiritually enlightened college seniors on the planet. Five years later, I’ve gone back to meditation—and that college memory is almost laughable. For as long as I can remember, I’ve been plagued by anxiety, perfectionism and over-functioning, always worried about the next item on my to-do list or agonizing over some mistake I’d made at work earlier in the day. My brain loves to sink its teeth into any new concept—especially those that promise happiness and “freedom from suffering,” as the Buddha defines Enlightenment. But alas, if you actually read Buddhist sutras, you’ll be reminded that no amount of thinking will ever lead you to Nirvana. I began giving meditation and mindfulness a real chance not too long ago, when my relentless way of doing things finally caught up with me. Don’t get me wrong, I’m not om’ing on my meditation cushion for an hour each morning, but for the past few months, I’ve been sampling sitting meditation classes around St. Louis. Last weekend, I visited the Blue Lotus Dharma Center in Webster Groves, the world headquarters of theCenter for American Buddhist Practice. The 90-minute Sunday service fascinated me. Apparently, there would be some meditation time, but I was curious to see if I could re-awaken my old collegiate knowledge by witnessing a more traditional religious Buddhist service, which included a sutra reading and a talk by the senior Buddist priest. Timidly walking into the room, I respectfully took off my boots and slunk to an open cushion on the floor—set in front of a low bench, with a binder of sutras, chants and reading material in front of me so I could follow along during the service. If you took away the intricate carvings and adornments gracing the shrine to Buddha in the front of the room and replaced the floor pillows with church pews, it wasn’t that different from the church services I occasionally visited as a girl. Some people wore special robes, and I wondered if I’d stick out like a sore thumb in my sweatpants, but no one seemed to notice. As I followed along in the binder, the two service leaders sat in front, facing us, and the group moved through some chanting and silent prayer, followed by a sutra reading (in Buddhism, ancient sutras are the religious scriptures, similar to the Bible or the Torah). I was surprised when the selected sutra reading was about mindfulness. No, let me re-phrase that. I wasn’t surprised that mindfulness—the state of active, open attention to the present moment—originated in ancient Buddhism. But the term has become such a catchphrase in the West, I’d forgotten how intertwined it was with Buddhism. Any Western definition of mindfulness will cite its roots in Eastern spirituality, but “mindfulness science” seems to be a New Age concept rapidly losing its original meaning. Western “founders,” like Jon Kabat-Zinn, have won national fame for such techniques as Mindfulness-Based Stress Reduction. Defining the practice as “Paying attention in a particular way: on purpose, in the present moment, and nonjudgmentally,” he taps into this rich spiritual practice for good reason—it works. According to the American Psychological Association, mindfulness meditation is linked to numerous psychological and physical health benefits, and although it’s harder to measure its effect in therapy, countless doctors and patients swear by its rewards. Listening to Senior Priest Sha’ul Hirschmann (Ngakpa Chökyi Lodü) read the Buddha’s teaching on mindfulness brought it all home. It’s easy to get caught up in the Western hype—the search and promise of some new technique or therapy model to provide instant relief from emotional burden and fix all our problems. But the weekend service reminded me of something I’d forgotten in my quest to just “feel better”: It is that simple. You don’t need to pay extra for a therapist who can list “Mindfulness-Based Stress Reduction” on their list of credentials. It’s not rocket science. Mindfulness is an ancient art, practiced for thousands of years without any special equipment or training. All you need is your mind. The idea of being in the present moment without judgmental thought (dwelling on the past or worrying the future) may be easy enough to understand on paper—or in a college course. But it’s a profound practice. Focusing on my breath—recognizing the quality, the length, the sensation—is exactly what the Buddha prescribed thousands of years ago. So simple it’s hard for us to credit, it’s a transformative practice. 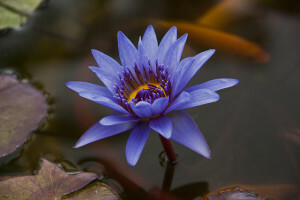 So, to give my trusty old brain some credit, I’m thankful my curiosity led me to Blue Lotus Dharma Center. It was the perfect reminder before the start of another hectic week that I have all the tools I need to “feel good” already inside me.